In the heyday of trailer sailers, 30 and more years ago, cheapness and internal room with a few exceptions took priority over high quality and sailing ability. In particular, a minimal cockpit for a complement of say four in a tapered stern ensured a tail-dragging boat. The Seascape 18, a modern take on the concept, has the quality and ability, none of the drag, yet still at a modest price. 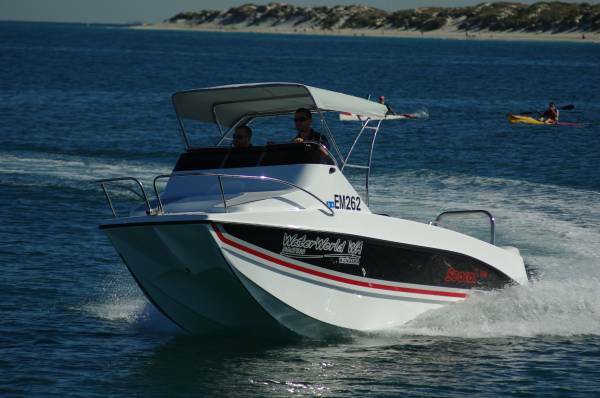 The Seascape actually has more in common with the current crop of sports boats than with the old trailer sailers, and, although there is nothing complicated about the rig, is capable of spirited performance. It certainly has the equipment for it: pentex working sails, carbon fibre spars, twin rudders, Ronstan roller bearing blocks, but with the cruising comfort of a furling headsail. At the same time, it really is possible to sleep on board. The fore cabin has a pair of bunks for tall people; there are no other traces of luxury, but the set-up is good enough for the occasional overnight pulled up on a beach. 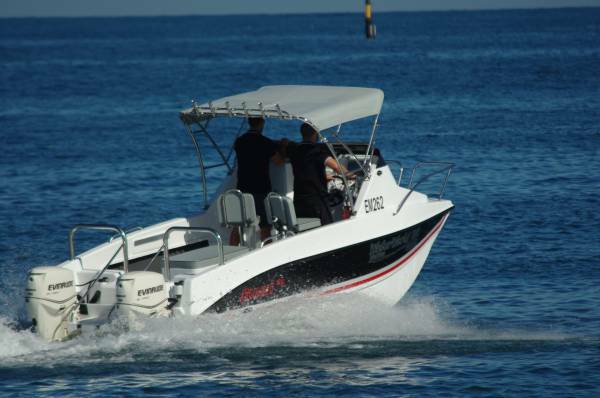 Unlike a sports boat, the Seascape has a swing keel rather than a dagger board. Aside from the possible drag of the slot in the bottom there is no real difference in effectiveness; the keel, with its 125kg of ballast, is high aspect and long: lowering it increases draught from 0.15m to 1.3m. And, of course, if it hits the bottom there is no sudden stop. Standing rigging is as simple as it could be: forestay and single shrouds with no spreaders, supporting a mast whose light weight makes it easy to step. The reefing bowsprit is also in carbon fibre – standard equipment includes a 32sqm gennaker. The bowsprit’s forward fitting carries a hoop for the mouth of a fabric launching chute. The whole system sits on deck, preventing water intruding into the cabin. The cockpit comprises most of the boat, and there are few obstructions in it. The natural seating position is on the coaming, supplementing the ballast keel, and hiking straps are fitted to give extra leverage to the self-propelled ballast. But as is almost inevitable for sailing reviews, wind was light and getting lighter, so the straps were not needed. What the light wind did show was what an easily driven craft the Seascape is. With gusts varying between three and six knots the average trailer sailer would have hovered between stationary and bare steerage way. The Seascape showed perceptible acceleration, and had the crew of three tuning the mainsheet and adjusting weight fore and aft. I want to be on board in 15 to 20 knots. The hull form is reminiscent of a 49er, with large planing areas aft and a minimum resistance bow. The significant difference is the ballasted centerboard that removes the need for trapeze athletics. It struck me that this could be the boat for the owner, a decade or two along, who used to sail something like a Hobie 18 on the ocean. I found I was describing myself, the sort of owner who might cruise the coast inshore, or sail out to Garden Island on the easterly and return on the sea breeze. 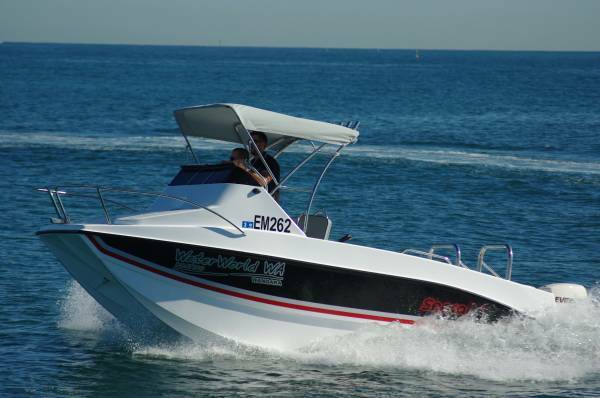 It could be a club racing boat or a powerboat substitute. 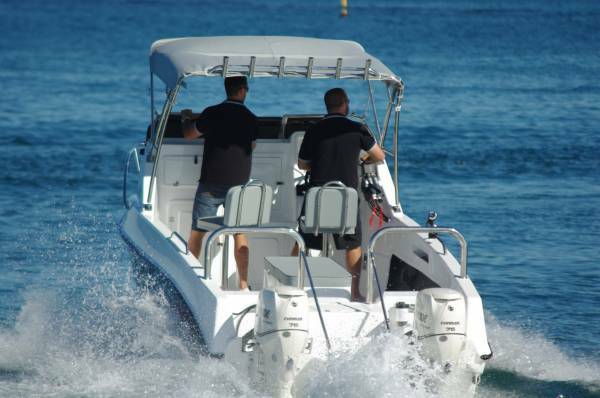 It does not have to be a purist’s yacht that stops when the wind does; an optional bracket takes an outboard motor. 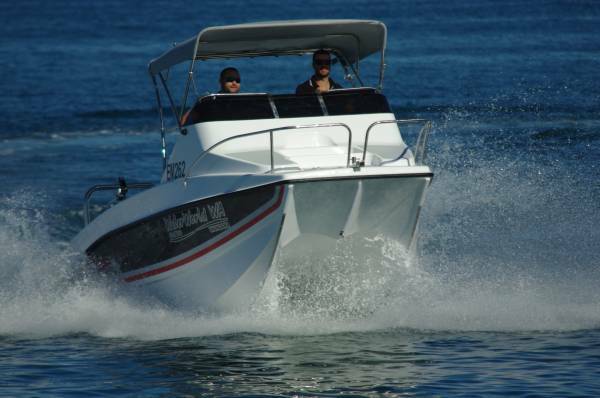 This is such an easily driven boat that the smallest of motors would do the job. The price for this European yacht of the year in 2010 (it is built in Slovenia) is $33,000, to which you need to add the price of a trailer. It works out at a lot of fun per dollar.